Each and every person walks in as a client, but leaves as a friend. I take special care to meet the specific needs and wants of each individual. Taking into account age and facial structure, I work with you to customize your look with what will become a subtle look that no one will know isn’t really your hair. Some may opt for an aggressive edge up versus a natural and soft, feathered hairline... each of which is personalized for everyone. No matter what you choose, know that in the end, you will have one less worry in your life because... being BALD is an OPTION! Let me make you the STAR of your own show and make you a HEADLINER! No one wants to lose their hair, but it happens. 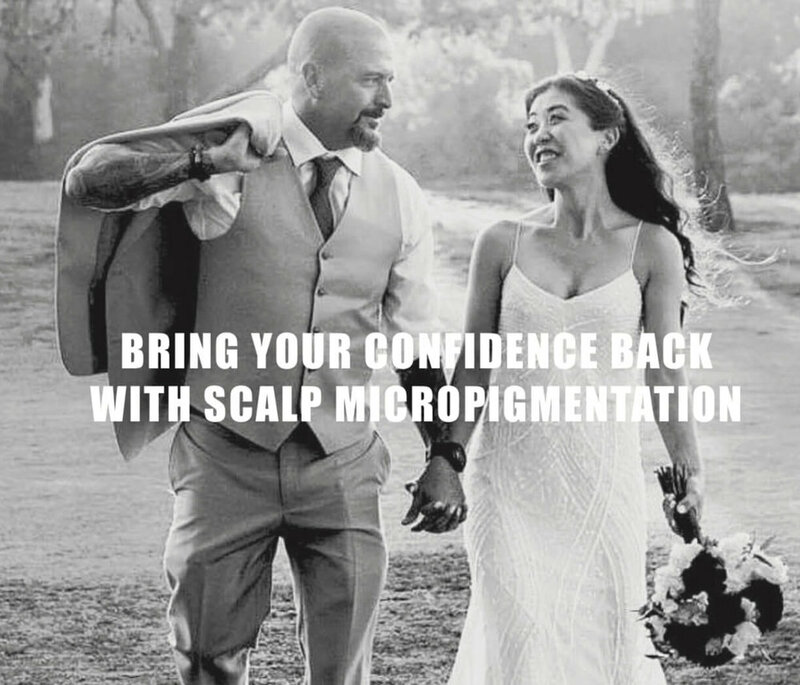 I started losing mine at 26 and my confidence was gone... until I found Scalp Micropigmentation and everything changed. After my own procedure, I immediately knew that I wanted to help others feel the way I did and I wanted to become the best SMP artist I could be. Confidence doesnt come from outside, its from within, BUT... no one sees your inside. Looking good in todays society is important and the smallest things (like a hairline) help. through the confident look on their faces is my biggest reward. Having been in the scalp micropigmentation industry since 2013, David has had over 750 clients so far (and counting). He has received multiple awards and accolades as one of the BEST SMP artists in the world as recognized by his professional peers. David has also worked with charitable organizations dealing with children with Alopecia and Alopecia Awareness. His passion for helping others, along with his genuine caring and level of perfection is what keeps men and women coming to him to perform their procedures with the utmost level of artistry, consideration and sincerity. David Hoffer is an internationally recognized EDUCATOR in the field of Scalp Micro Pigmentation as a master trainer with the world renowned ScalpCo Academy, winners of the 2018 World Trainers of the Year. His one on one approach and small teacher/student ratio allows him to focus attention to each pupil in order for them to acheive the best training possible. First I have to admit I was really apprehensive to have someone tattoo my head. David just did another touch up for me...and it came out phenomenal. Not only is David a fantastic artist...but he uses THE best products...AND he is a straight forward business man with ethics that are few and far between these days. I got married in September and I felt like a million bucks...my wife was happy ...and not one friend (and some of my friends have zero filter). I've done the research and seen what's out there...David should be your first and last call. 100% satisfied thanks to David after having a number consultations and becoming completely discourage from this process I found David my experience was life-changing thanks to him anybody out there considering this procedure your search is over. You have found hands down the best in the business. Wow... Increible experiencia con David Hoffer. Despues de muchos anon de investigar y averiguar que es este proceso de la micropigmentacion capilar, decidi visitar a David Hoffer en su local de Huntington Beach, CA. Desde que puce un pie en su consultorio, me senti sumamente comodo. David me explico de todo el proceso y cuantas sesiones en base a su experiencia iba a necesitar pars obtener los resultados perfectos pars mi persona. David, me contesto absolutamente todas . preguntas que tenia. Cuando Sall de su consultorio la primers vez que lo visite, me di cuenta que estaba con el mejor artists y professional de el Sur de California. Una vez que empezarnos con mi primers session hasta la ultima, los resultados se fueron dando poco a poco hasta que ya no fue necesario hacer ninguna session extra. Muy aparte de todo, David es una persona que to hace sentir muy comodo. Te ofrece agua si tienes sed, si quieres tomar "un break" o si quieres ver una pelicula o documental en Nefflix con una super pantalla que tienes frente a ti mientras el esta haciendo su trabajo (o deberia decir arte). Si sun estas con dudas o preguntas hacerca de la micropigmentacion capilar, no dudes en buscar a David Hoffer. Sin ninguna duds, el es el mejor. Te va a orientar en el terra y al final, sin ninguna presion vas a ser to el que decide si es to tiempo pars proceder con este proceso de SMP En lo que respects a mi persona, ahora pienso que he debido hacer esto muchos anon atras. Just send a 45° photo of yourself. Apply moisturizer three times daily to prevent dryness and flaky skin. We recommend using a non-perfumed moisturizer such as Aveeno body moisturizer. Avoid growing hair too long. If you do need to shave your head, we advise using an electric shaver only. We recommend a Remington R5 (scroll down to see options) or similar shaver. No wet shaving (razor blade) for 10 days post. SWELLING: A slight amount of swelling is typical for a fresh tattoo. If swelling becomes excessive, uncomfortable and you feel the pain radiating beyond the site of the tattoo, then this is a sign of infection. FEVER: Fever is a symptom of an underlying condition, which is most often an infection. Please contact a medical provider if you think you may have a possible infection.